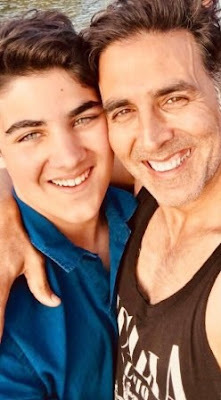 #AkshayKumar wishes his son #Aarav on his Birthday and claims that his son is better than him in every sense of the way! The actor just posted the sweetest birthday post for Aarav. The actor shares a selfie with his son and wrote, “Taller than me, smarter than me, wealthier than me, nicer than me! My wish for you this year and always will be to have everything more than I ever had Happy birthday Aarav." Akshay Kumar is married to Twinkle Khanna and the couple is blessed with two beautiful kids, their first child is a boy, whom they named Aarav and second child, a girl named Nitara! On the work front, Akshay Kumar was last seen in Padman And Gold, both the movies did remarkable business at the box-office. Next Akshay Kumar as lined-up a massive line of releases, starting with 2.0, Kesari, Housefull 4 and Good News. 2PointO is an upcoming science fiction film written and directed by S. Shankar, co-written by B. Jeyamohan, and produced by Subaskaran Allirajah. The film serves as a spiritual successor to the 2010 Tamil film Enthiran, and features Rajinikanth reprising the roles of Dr. Vaseegaran and Chitti, alongside Akshay Kumar and Amy Jackson. The film is scheduled to be released in theatres on 29 November 2018.